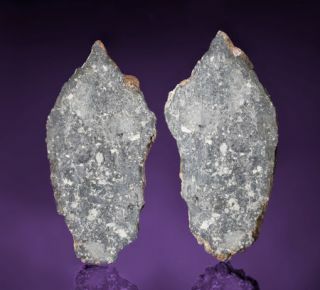 A moon rock for sale by Heritage Auctions came to Earth as a meteorite. The specimen is expected to sell for upwards of $380,000. If you have some serious cash lying around, a chunk of the moon could be yours. A piece of lunar meteorite is on sale at auction, and experts estimate the final price will tally at keast $340,000. The rock, called Dar al Gani 1058, is the largest piece of the moon ever to be auctioned, according to Heritage Auctions, which is handling the sale. The 4-pound (1815 grams) meteorite is also the fourth-largest chunk of the moon available to the public, since the moon rocks collected by Apollo astronauts were never put up for sale. "When it comes to the market for moon rocks, size does matter — but so does origin," said Robert Pearlman, editor of space history and artifacts site collectSPACE.com, a SPACE.com partner and contributor. Moon rocks retrieved by human-made robotic probes, such as those sent by the United States and the Soviet Union, fetch higher prices than lunar meteorites, because collectors value the history they represent, he said. "For example, three seed-sized pieces of the moon that were brought back to Earth by a Russian robotic probe in 1970 were sold at auction 30 years later for $442,500," Pearlman told SPACE.com. "And while the moon rocks recovered by the Apollo astronauts are considered National Treasures and have never been awarded to individuals, hypothetical appraisals have suggested even a 1-gram sample could be worth millions." The slab-shape Dar al Gani 1058 came to Earth via natural forces, originating as a piece of lunar highland breccias from the moon's far side, experts say. Scientists don't know exactly when it was dislodged from the moon and fell onto Earth, but it was found in Libya in 1998, according to the Meteoritical Society. It was put up for auction by an anonymous collector. The opening bid for the moon rock is $170,000, and the auction ends Oct. 14. Heritage Auctions calls the specimen "worthy of the most important natural history museums in the world." While the rock is expected to go to a museum, a private buyer could also be the highest bidder.